Given the fact that Costock has always been quite a small settlement, there is a surprising amount of history attached to the village. Part of this is due to the location of the village on a main route between Nottingham and London and partly because it remains today very much the same as it has been since the Magna Carta. The village history is documented in detail on the Victoria County History website. Founded in 1899 and originally dedicated to Queen Victoria, the VCH is an encyclopaedic record of England’s places and people from earliest times to the present day. For copyright reasons it is not permitted to copy and paste sections to this website but links are provided below for your convenience. The Normans conquered England in 1066 and complied a sort of Income Tax return Domesday Book in about 1086. At that time several manors in Costock were held by Saxon thanes Gordic and Algar. The first Norman lords were Roger and Ralph de Birun (later Byron), the de Birons took the tile de-Cortinstock. Robert de Biron gave the churches at Costock and Rempstone to Lenton Priory who held them until it was dissolved in about 1540. 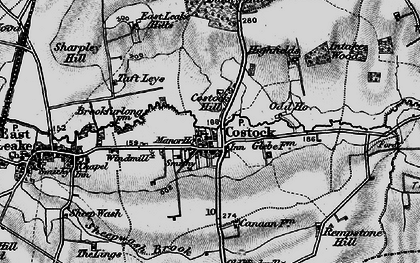 COSTOCK, or Cortlingstock, a parish in the district of Loughborough and county of Nottingham; on an affluent of the river Soar, adjacent to the boundary with Leicester, 4¾ miles E of Kegworth r. station, and 8¾ S of Nottingham. Post town, East Leake, under Loughborough. Acres, 1, 320. Real property, £2, 648. Pop., 440. Houses, 103. The property is divided among a few. Some of the inhabitants are stocking-makers. The living is a rectory in the diocese of Lincoln. Value, £395. * Patron, the Rev.S. Millard. The church is ungainly but good.